O.K. Here's the idea... Build a hearse, any hearse, any way you want to. It could be compleatly stock, customized, a salvage yard wreck, a dragracer, Nascar, or a lowrider. I've got 2 hearses under construction at this moment, a '59 pro street, and a Jo-Han I recently dug up(Pun intended). so let's get buried in this, and try not to make any grave mistakes! O.K. Here's the idea... Build a hearse, any hearse, any way you want to. It could be compleatly stock, customized, a salvage yard wreck, a dragracer, Nascar, or a lowrider. And how does Oct. 31st as the end date sound? I've got 2 hearses under construction at this moment, a '59 pro street, and a Jo-Han I recently dug up(Pun intended). so let's buried in this, and try not to make any grave mistakes! 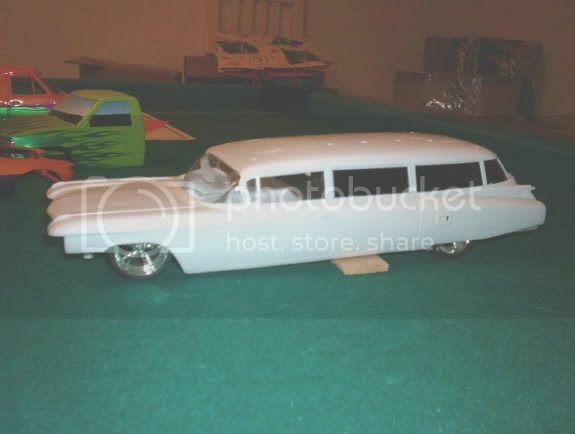 I'll share some pics of the two hearses I built later today. Hearses. Hmm now im gonna go and buy some 40s and convert them. What is the qualifications for a hearse? Does it have transport the dead or something that was actually used for a hearse. You mean something like this....? I was thinking that because hearse kits are hard to come by and deathly expensive, most of us would resort to phantom hearses anyway. I've carried a few ideas around with me for some time, and maybe I'll crack out the putty and give this a try. Yes sir... Ambulances are included. Express Delivery! 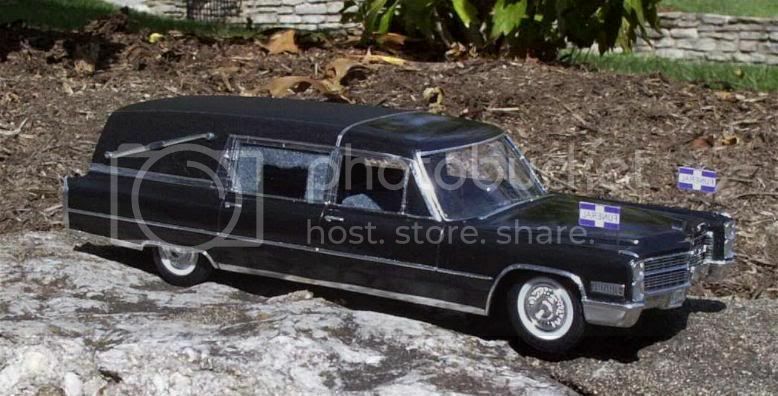 Awesome hearse,Slabbedask,people will be dying for a ride in that.Sorry this seems to be the bad pun CBP. All bad puns are welcome! I used to work in a cemetary, and I've heard them all, LOL! Oh and Slabberdask... OH YEAH!!! Now that's C L!!!!! Those are awsome Jroc. I just got two more Jo-han hearses to work on, but I haven't decided what to do with them yet. And Flathead... LET'S ROCK!!!! I got to get in on this. But I think I will be done before oct 31. since as I was thinking of brinning this with me to the show in Drammen and thats in mid september or something. I love the name you gave you're project! Lets see some pics when you get a chance! P.S. 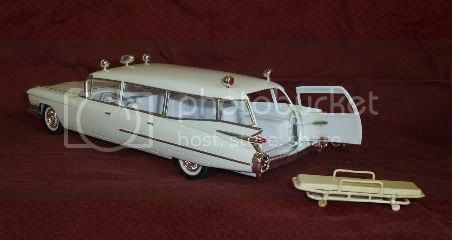 I finally took pics of my hearses, and other kits. As soon as I get them developed and put on disk, I'll try to get them posted. 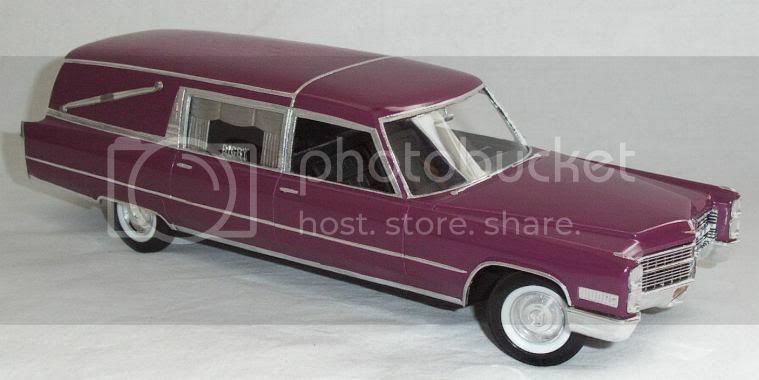 And here is the first pics of my Ford-hearse. Engine pictures only so far. What do you think of my wiring? That's a wicked flathead you've got there atmobile. I have a feeling you might BURY the competition (or a customer ) with it. All kidding aside, it looks great. Keep up the good work! P.S....If you have any bad puns you want to add, Your more than welcome to! 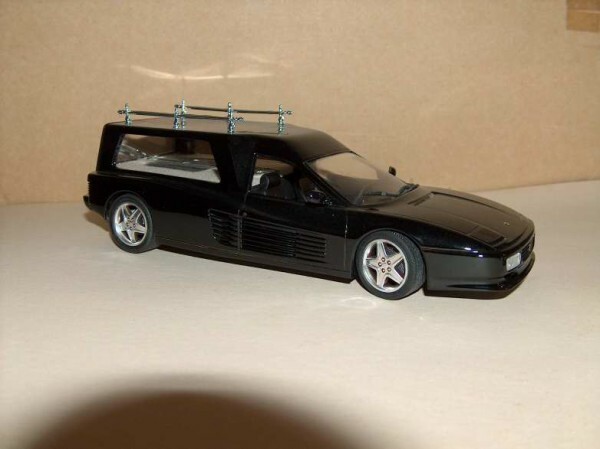 This isn't only a hearse CBP, it's also good for a laugh! Ok count me in. It might take me a short bit to get started but countme in. I've been thinking of something to do with my 55 Nomad, and a Hearse sounds alike a GREAT idea. Maybe I'll stick a mini frig so the guys can have some corpsecicles, and a sound system so the unfortunate fellow, can have one "last" Monster Mash. Heh. It's not what you do, it's how you do it. You be you, and I'll be me. It's just a matter of STYLE!!! I found a picture on the internet of a '57 chevy hearse. Man it's cool. keep us posted on the '55. Sounds like something I could really dig. (except for the corpsecicles.... EEEWWWWWWWWW!!!!!) P.S..... Make sure the suspesion is good and stiff, you don't want your customers jumping out and scaring the tourists! That's a drag, Atmobil! I really hope you can find a way to prove your ownership. Did the guy you got the car from have it titled? Because I would think you'd only have to prove you acquired it from the last documented owner legally. This looks like a fun one to jump into. I'm converting a goast busters to a hearse. Here's a first mock up. to the group. As I said before, if you have any bad puns, use them. We could all use a good laugh. Your Ghost Busters wagon is cool. I've converted two of them so far, and I'm thinking of doing a third one. Keeps us posted on the progress, we GRAVE, I mean crave the posts. Well... 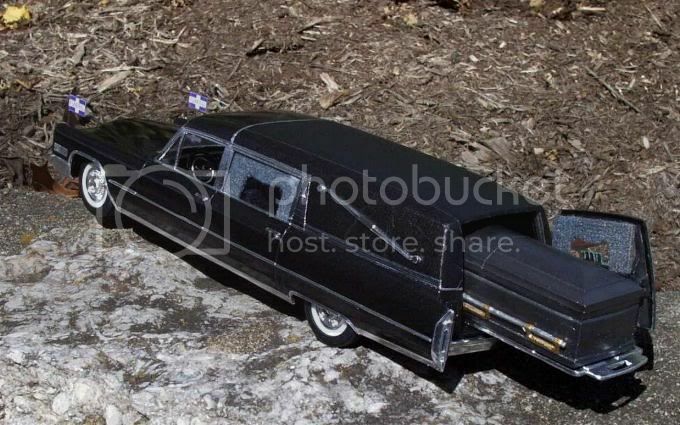 I've got to get back to my hearse kits, as always, I get buried in my modeling! Nope. That's one of the problems here. Nobody even knows if the cars has been on Norwegian plates, but I do think that it has been because of the stickers in the windows and a servicesticker in the doorpost that is from a Norwegian petrolstation. But I I am a going to talk to a guy that has some knowledge on how I can get new papers on the car. Looking forward to the updates. I really dig this forum! as i'm dying to get started on it! it'll look somewhat like this, only i will use a burgundy instead of red. i think it will be killer. I've got that picture on my screensaver flathead. Did you see the pics of the '57 chevy hearse? I'd like to build a model of that one. It chills me to see it. yeah, i've seen them before. How's this for a plate.